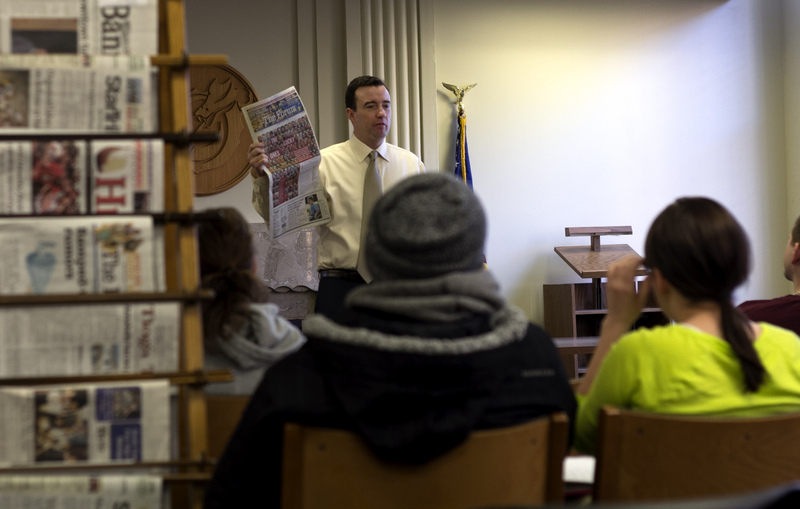 Matt Von Pinnon, Editor of the Fargo Forum, was a guest speaker for Ethics Day to discuss different ethical situations with students from the Mass Communication department. Students and faculty members crowded into the Center for Business on Thursday to celebrate MSUM’s first Ethics Day. Seventeen professionals from various fields in the Fargo-Moorhead area discussed ethics and how they relate to the workplace. The panel touched on several workplace ethics issues, including the relationship between morals and ethics, dealing with relationships in the workplace and companies’ responsibility to its employees. Senior manager at Eide Bailly, Amber Ferrie, echoed this sentiment. “Ethics is not a class you take in college. You’re only as good as the last decision you made,” Ferrie said. Several others in panel discussed the actual definition of ethics. Paul Richard, senior vice president of compliance, legal and public policy for Sanford Health, remarked that ethics in the workplace is really about corporate responsibility and accountability. He reminded students that business decisions can be technically legal but still unethical. “Ethics remains a duty to that which is unenforceable,” Richard said. From the discussion, it is clear that in any career field a student chooses, he or she will be using their ethical code on a daily basis. Curt Hibl, development manager with Evolution1, a consumer driven health company, uses a rigid ethical code as he deals with personnel information everyday. “Ethics is a critical part of our business as we have access to personnel information that is critical like credit card numbers,” Hibl said. A recent graduate of MSUM Ryan Courneya now acts as the district executive of the Boy Scouts of America. “We find leaders and their application goes through several points of review. It is important that their values and belief system align to the mission of the Boy Scouts,” Courneya said. Lastly, several panelists discussed relationships in the workplace. All agreed that relationships will most likely happen between coworkers although it is important to make it known to the employer if a relationship is occurring. At the end of the session, panelists gave students a few guidelines they can take into their careers. First, know the company you are going to work for. It is important that company’s values mirror your own moral compass, as the employee needs to be comfortable with the decisions his or her employer makes.